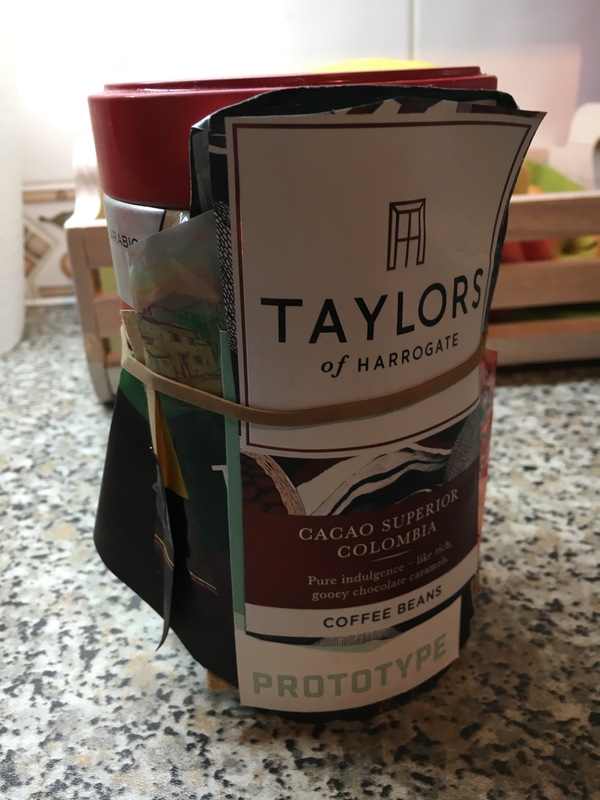 There’s a tradition in our house that every time we open a new bag of coffee beans we cut out the label and place it under the elastic band that’s around the pot where we store the beans. The pot is an old Illy coffee pot that we’ve had for years, over that time the number of labels has grown and the elastic band expanded. Each of the labels compacted under the band has a little story of its own. The story might be as simple as a trip to the local supermarket. Some of the stories are about special occasions; others are about holidays. The Pilgrims Coffee is from Lindisfarne. There are stories about trips out and also stories about trips further afield. The Lojano is from Ecuador. 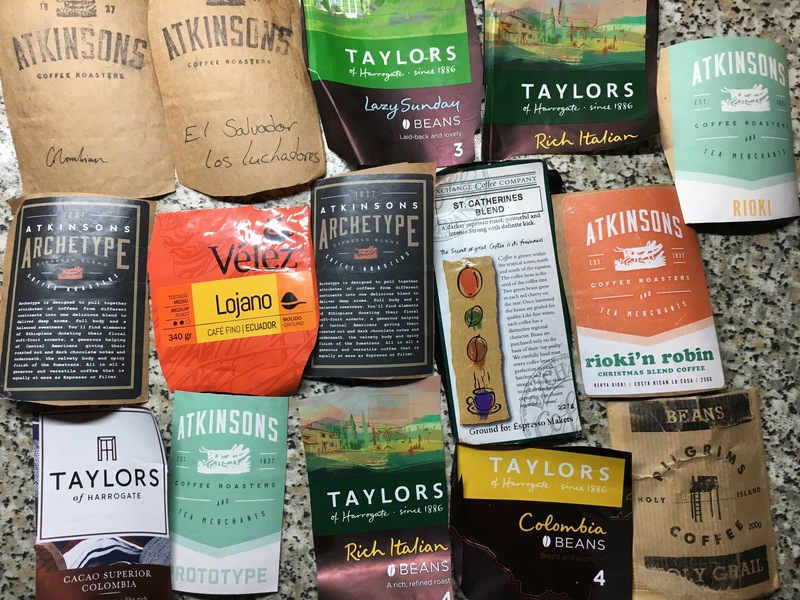 There are coffees that are there because they are favourites, others are special treats. Some we return to, others have been a unique experience. The idea that we have drunk a coffee called Lazy Sunday is a deep irony. The coffee bean pot band is a treasure trove of memories. There once was a boy who loved swords.He wasn’t old enough for a metal sword wooden ones were more than adequate. They would be swung around his head. He’d spin and thrust. He’d leap forward, twist and swing the sword. His wrist would twist and push the sword forward. He’d jump and reach upwards. He’d land and position. In a world of his own he was entranced by the motion and the movement. There was a gardener who would watch as he choreographed his moves, smiling at the pleasure dance. The gardener had been trying to grow a particular flower, a tall slender flower with a multi-floral bloom at the top, an Agapanthus known romantically as the African Lily. The gardener had seen others grow these floral delights but had only managed to grow leaves until this particular year. This year one of the plants decided that it liked it’s location enough to burst into bloom. Upwards it pushed it’s long stem and moved it’s buds into position. The gardener watched as the buds steadily filled out ready to blossom. Then one day, as you’ve probably already guessed, the boy with the sword walked up to the gardener and handed him the decapitated stem and buds. They were close to bursting, but they wouldn’t get the opportunity, this was not to be their year. The gardener looked at the stem and looked at the boy and thought about all of the enjoyment that the boy had gained from his dancing and considered it a small price to pay. He looked at the boy and he laughed. African Lily would have to wait for another year. Many years would pass and the boy would no longer dance around the lawn with his sword. The gardener would, eventually, grow another tall slender stem and watch the buds move into position. Maybe, just maybe he’ll watch them bloom but even if they don’t he’ll think about that boy with his sword and laugh. In a previous story I told you about an experience with large waves at Hornsea. I also told you, in another story, about my Dad’s less than stereotypical approach to cars. This story brings those two threads together again. When I was younger we lived in a house that still had an open fire. This type of fire were, at that time, being replaced with gas stoves across the UK. There’s something magical about a proper fire though. There are environmental concerns also, but there’s something primal about our connection with fire. In this particular house the open fire wasn’t the main form of heating we had, as I remember, central heating. This left the open fire for special occasions and when it was very cold. The only thing I remember being burnt on the fire were logs. The logs were stored outside in a semi-neat pile at the back of the concrete garage. The logs got to the pile in one of two ways; they were extracted from people’s gardens (with their permission of course, another story for another day) or they were picked up as driftwood on the beach. I don’t know whether he did but I can’t imagine my Dad ever buying logs. Collecting driftwood was something we would do on winter weekends. Summer weekends were spent at the allotment, but once the weather had changed it was time to walk the beaches and bring back whatever we found. This was mostly an opportunistic activity, we weren’t at the beach to fill a quota of wood, we were going to see what we could see. On these adventures the car always had a trusty bow-saw deposited in the boot and we would go combing. In the particular area of the east coast of England where I was raised there are miles and miles of beaches, the North sea is also a significant shipping route and the two together made for lots of discoveries. There were five of us on these excursions and we could carry pretty much anything we found. I have in my mind carrying a large log on our shoulders, my Dad, my brother and me. In my imagination this piece of wood is a broad tree-trunk and over 2 metres long. As I think about it now, I’m not sure how that worked because we would have been radically different heights, so perhaps that’s not quite how it was. Having recovered our spoils we would stand at the back of the car sawing up pieces of wood so that they would fit in the boot. These eccentricities always gained us a certain amount of attention from others on the beach, some of it admiring, some more scornful. Once back at home the bounty would be cut up into fire sized logs and placed onto the log-pile to dry. Once the days work had been completed, but only on certain occasions, one of my parents (my Dad mostly I think) would lay the fire and we’d all sit around and watch it burn. We knew which of the logs were driftwood because they would burn in different colours, magical greens and blues, because of the sea-salt in them. Sometimes the fire would struggle to get going and my Dad would place a piece of newspaper over the fireplace, covering the fire, to get the draw going. He’d do this with his forehead on the newspaper against the top of the fireplace and his arms outstretched to the sides to spread the newspaper out. My Mum never seemed happy about this course of actions. I remember being fascinated by the way the flames would start to grow and and eventually roar as the air swept passed them up the chimney. Normally the time would come for toast, or crumpets, which we would toast over the firewood with a long brass toasting fork. We would argue about who’s turn it was to go first because we were so eager for that unique flavour of wood-fire toasted bread, melted butter and home-made jam. I still love to sit and watch an open fire. There hasn’t been much new content on this site this year, there are many reasons for that, but I have to admit that the primary one is that I just didn’t get around to it. It’s worth noting that the top 2 are by far the most popular posts. I have a list of ideas for the My Stories posts in my to-do list, I just need to get the words typed, so hopefully some more to follow in 2016. All memories are manipulated by the passage of time, I’m aware that for this one I’m particularly conscious of that. The other evening I was talking to my parents about an event that happened when I was a teenager. In those days I played rugby at least once a weekend, but more often twice. This involved playing for both a local rugby club and for my secondary school. My Dad’s recollection is that in this particular game I was playing for the school team, against the school teachers, that’s not something I remember so I’m not sure whether this is true or not. The game was certainly being played on one of the pitches at school. At some point during the game I received a boot to the chin. My recollection is that this was received whilst trying to dive in front of a ball that a member of the opposition was kicking further up the field. Clearly I mistimed my dive and got a bit too close. The rest of the game is a mystery as is the journey home. The next thing I have is a dim memory of falling down the stairs – while I was trying to go to the toilet. This isn’t as odd as it sounds, at my parent’s house the door to the toilet is next to the top of the stairs, but it does mean that I missed the toilet door by at least a metre. My next dim memory is of my mum talking to me in the car (on the way to the hospital). Apparently, I was steadily drifting off and the only voice that I would respond to was my Mum’s. Time continued it’s merry journey, but my participation in it was limited. I have a memory of lying on a bed with people trying to get me to do things, but that’s about all. My Mum’s memory is of walking into the Casualty unit at the hospital and being waved through by the receptionist; I clearly looked unwell. The following morning I awoke and looked around to find myself in a hospital ward. The bed opposite was occupied by a man who had a shaved head and stitches that started just above one of his eyes and reached all the way over his head beyond where I could see. He smiled at me and said “morning!” The man in the bed to the right had a similar cut but this time from ear to ear. My first response was to run my hands over my head to see where the damage was. Eventually I found a graze on my chin which was developing a nice bruise beneath it; it was a relief. Later on that morning there was a ward round. The person leading the round (a Consultant I assume) was not impressed. In my notes there were a lot of x-rays of my head, the Consultant looked through each one slowly. “Why did we take so many x-rays?” he asked. “Because he wouldn’t stay still.” was the answer from one of the juniors. “Wasn’t it obvious what was wrong with him?” the Consultant responded. There was no response to this question. That was all that was said, no one spoke to me, I was just the patient. What needed to be said had been said and it was time to move on. Later on that day it was my time to move on.